I was back in Westport only a week after we finished the filming of episode 2 of Dynamic Range but this time with the family. It was the usual normal weather i.e. mixed. On the day we arrived a went out to Bertra Strand as it’s only 15 mins away from the hotel to try get a few images before sunset. I was hoping for the sun to shine on the side of Croagh Patrick Mountain. It kind of worked for the lower slops of the mountain which now I think adds a bit more drama to the image. 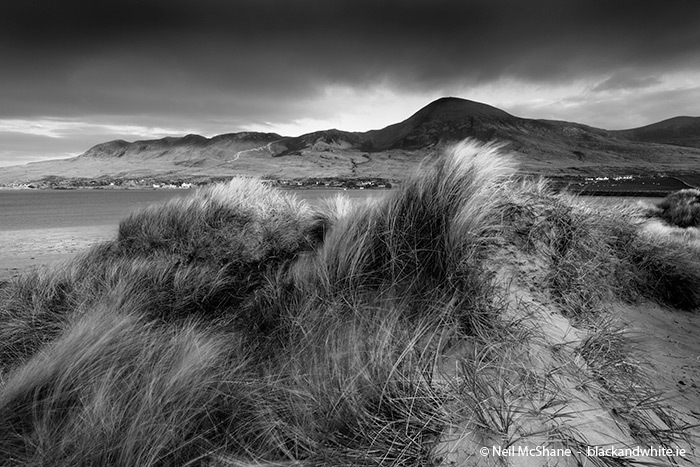 Also the strong wind blowing the grass on the sand dunes in the foreground was the key to this composition and the way the tips of the tall grass is lit up by the setting sun in contrast to the dark clouds over the top of Croagh Patrick. I knew there was a reason why I always return to Westport and Bretra. You will never come away with the same image and I have being coming here for the passed 10 years now. Looking forward to the next 10 years. I really like the way the grass and the mountains take on the same shape. Sort of foreground mirrors the backdrop. Thanks @bikingbadger for your comment and well spotted on the mirrored shapes.